Delivery is free in the contiguous USA on all ovens except Giganto! If you are in AK, HI, or islands off the mainland please contact us for a quote. 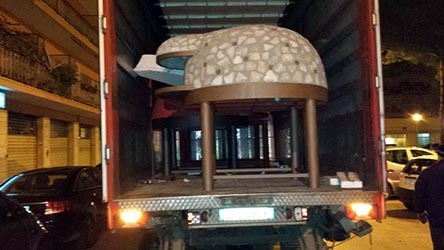 For the Giganto oven please contact us for a shipping quote to any location. You will need a forklift on your end to unload it. We ship with common carriers to curbside only, usually this means driveway. Liftgate service is included where needed. Yes, all our shipments are fully insured against loss or damage in transit. Can the driver place the oven on my base? Unfortunately not, the driver does not have the equipment to do this. Can the driver put the oven in my garage, backyard, patio, etc? This is not guaranteed and depends on the accessibility of the place and what the driver feels is safe. For instance, even if the driver wants to he may not be able to move the oven over grass, gravel, steep inclines, steps, or similar obstacles. However, in most cases where possible the driver will try to place the oven where you want it. Will i be notified of the delivery time? Yes, of course. The carrier will call you prior to delivery to schedule an appointment. Please do not take time off work or otherwise change your plans unless the carrier has called you and scheduled a delivery time. Also, please do not hire workers to work on your oven before you actually receive it - delays do happen and sometimes an oven gets delivered later than anticipated, please wait until you actually receive the oven before investing into any work to be done with it. Please note that we are not responsible for any charges that may be incurred due to missed delivery dates. This depends on your location. We normally ship within 2 business days of payment receipt. Transit times vary between 2 and 8 days. For instance Long Island, NY - 2 days, Chicago - 3 days, Florida – 4 days, etc. Transit times are not guaranteed, carrier-related delays do happen from time to time. Should i inspect the oven for damage on arrival? Yes, please inspect it for visible signs of damage. If you find any obvious damage please note it on the bill of lading before signing for it. In the case of modular oven kits (Volta, Neapolitan etc) that are packaged in pieces the driver will not wait for inspection, if you later find any damaged parts please contact us. How can i move your 1400 lb oven into my backyard after it's delivered? You definitely need a good plan. Very often an engine hoist and a dolly will do the job. In other cases a pick up truck, bobcat, other lifting equipment. Please see our post here. If this does not seem possible to you then you may want to consider one of many modular kits that we carry, they are a lot easier to handle but require assembly. I'd like to save and pick up the oven in NJ, how do i do that? 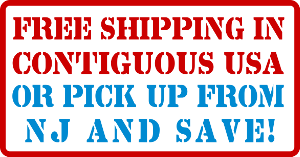 This is a great option which will save you money and shipping time. Pick up hours are Mon-Fri 9 am to 4 pm. Just place an order on the website and select the pick up option at checkout, the system will apply the discount. We will then follow up with pick up information. Ovens are usually ready for pick up in 24 hours. Nonno Peppe and Nonno Lillo ovens can be picked up with a hatchback or minivan, all other ovens will require a pick up truck or trailer. We do have a forklift on our end to load the oven on your vehicle. We currently have 2 pick up locations: Piscataway and Kearny, some products are at one location and others at the other, please inquire if you wish to know in advance where specific products are. I've seen a similar oven for sale, is it the same as yours? In most cases not. 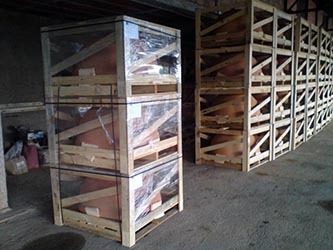 By agreement with manufacturers many of the ovens we carry are exclusive to us in USA and have been so for years. 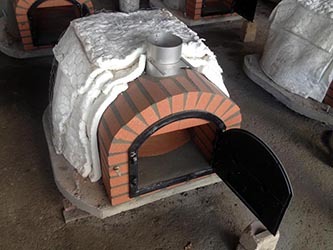 Our ovens are made with a lot of input from us, we request from manufacturers particular things like specific insulation materials, cements, drying times, packaging, and more. Ovens may look similar on the outside but they may be very different in composition, durability, and performance. How do you select which ovens to sell? We basically look for best in class ovens. We have been working with same ovens for many years because we believe they represent the best value. We invite you to compare our models to similar-sized ovens from our competitors. Why are your prices lower than from other suppliers? To get the best possible price we import our ovens directly from manufacturers in full containers and try to cut all overhead costs, i.e. anything the customer doesn't benefit from. Are your ovens in stock? Yes, we keep a stock of hundreds of ovens at our partner warehouses in Kearny and Piscataway, NJ, this is what allows us to offer our ovens quickly. If an oven is out of stock we will put a notice on our website ASAP. If you are interested in an oven which is currently out of stock we will contact you with an estimated time of arrival. We do not require a deposit if you would like to reserve an out of stock model. Can i come and see the ovens in person? Unfortunately not. We have been concentrating on nation-wide advertising & shipping and are proud to have customers in each and every US state. Being that our customers are all across the country there is no location where it would make sense for us to maintain a showroom. We also believe that you can gather more info about an oven from website description, pictures, and videos than from seeing the oven in person without being able to fire it up. Do you sell commercial pizza ovens? Our ovens such as Volta and Giganto are currently in operation in many restaurants and catering businesses throughout the country, for some examples please see our Where to Try section. However, none of our ovens are UL or NSF certified. Please research if you need these certifications prior to purchasing an oven. Can your ovens be used on mobile pizza trailers? Yes, many of our ovens are currently successfully used this way, such as Volta, Maxi, Prime, you can see examples in the same link above. Do you have ovens for indoor use? Many of our ovens can be installed indoor, such as Volta, Neapolitan brick ovens, Spazio. Do your ovens come with warranty? Our ovens come with our quality guarantee and a 1 year warranty on removable parts. Please keep in mind most our ovens are traditional hand-made products and hence we cannot offer a standard technology-age warranty. If you are concerned please ask us prior to purchase. 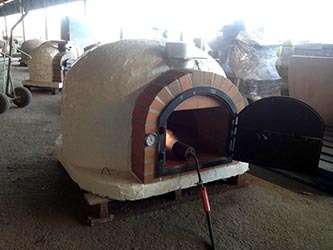 Virtually all wood fired brick, clay, or precast ovens have some degree of cracking and ours are no exception. Volta kits and Neapolitan brick ovens have almost no cracks but the Portuguese ovens will typically have a few cracks on the inside and possibly a couple on the outside. The cracks are very thin. They can be easily repaired and even if they are not they do not affect the performance of the oven in a noticeable way. Our Classic Portuguese brick oven already comes with a container of patching material. How long does an oven take to heat up? To get to pizza baking temperature a Portuguese brick oven will take 1-1.5 hours, Volta kits 45-60 min, and Nonnos, Primes, and Pulcinella ovens about 30 min. Do your ovens need to be cured before first use? Yes, curing minimizes cracking. It consists of firing the oven slowly with small fires over the course of a few days. We email instructions to customers. This relates to brick and precast ovens only; steel ovens do not need to be cured. Are your ovens NSF or UL listed? Unfortunately not. Very few wood fired ovens are UL or NSF listed and this makes a difference only for select commercial applications. Our ovens are not certified simply because we never applied for certification. Can you install the oven too? No, but in NJ and NY we can refer you to installers who have worked with our ovens before.